A substantial part of the REDEA's resources is focused on the development of the economy in Međimurje and support to entrepreneurship. Activities of the development agency are aimed at improving the entrepreneurial environment in the county. 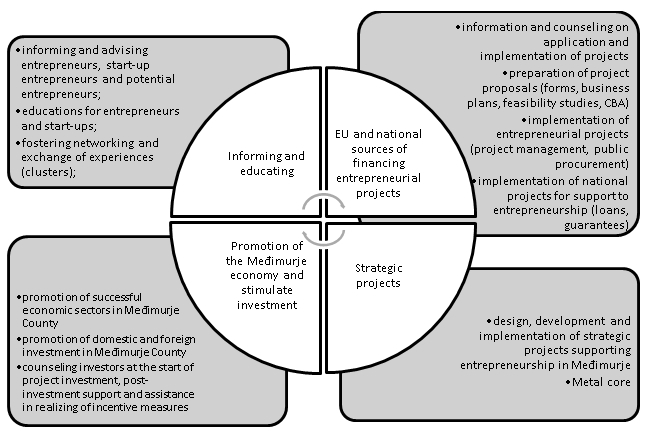 Information relevant to business improvement and information about current programs provide support for all future and existing entrepreneurs in the Međimurje County. Information can be requested by phone, mail, or in direct conversation with prior notification / confirmation letter. Raising the competence of entrepreneurs is one of the key prerequisites for the development and growth of entrepreneurship in our county. REDEA has organized many training activities in different business areas with an emphasis on contemporary approach to the issue. REDEA’s experts conduct training on topics for which we have expertise, while in other cases, we choose consultants with excellent references, experts from universities and institutes as well as businesses that are particularly successful in their field of business. In some cases, the support for the organisation of these seminars is provides by the state bodies, primarily the Ministry of Entrepreneurship and Crafts and the Ministry of Regional Development and EU Funds. Topics of education we choose according to expert estimates of the needs and requirements and considerations of entrepreneurs, and in the year 2015 a great emphasis on trainings for entrepreneurs was in preparing project proposals for tenders co-financed from the European Regional Development Fund (ERDF). In order to encourage networking and exchange of experiences of entrepreneurs in particular sector or area, we organize meetings of entrepreneurs and education clusters and examples of good practice from abroad. We encourage collaboration on projects, transfer of knowledge and good entrepreneurial practices from Međimurje. The program of financial incentives and subsidies vary in complexity and application documentation. Since 2015, the entrepreneurs can use the funds from the EU Structural Funds, in which there is a significant increase is grant aid that can be achieved for individual projects, but the methodology for the development of applications become more complex. It is for such complex schemes that REDEA offers a comprehensive service of preparation of project documentation and project management services as well as the preparation and implementation of public procurement procedures in accordance with all requirements of the program or of the public invitation. We are especially proud of success in making project applications for Međimurje entrepreneurs for EU funding and for the expertise and experience of the employees of the Department of Economic Development. Also, we are familiar with the opportunities offered to entrepreneurs by the programs of the Union (primarily COSME and Horizon 2020), and we can focus on how to submit businesses project proposal for co-financing through EU programs. Our employees have years of experience and excellent results in the preparation of project proposals from the program “Business impulse” of the Ministry of Entrepreneurship and Crafts, but also in the preparation of project proposals for tenders of other ministries that have the role of supporting entrepreneurship. REDEA will continue to meet the needs of the Međimurje economy defined in the Međimurje county Development Strategy using EU funds as an important source of financing for the development needs of Međimurje economy. Promotion of successful economic sectors in Međimurje County is an important part of our activities. In addition to the sector of information and communication technology, which is the responsibility of our daughter company Technology Innovation Centre Međimurje (TICM), we emphasize the sector for metal processing and textile for which we have prepared a brochure with information of active SMEs in these sectors. We promote successful sectors at various events, through cooperation with foreign chambers of commerce, embassies and consulates. In 2015, we visited the regions of Veneto and Lombardy in Italy and Salzburg in Austria and Baden-Wurtemberg in Germany, where we presented the economy of Međimurje County and companies from the most propulsive sectors. We promote domestic and foreign investment in Međimurje County, communicate with local governments and we do an overview of business zones. We act as ONE STOP SERVICE CENTRE for investors, and we consult investors throughout the entire investment process (assistance in site selection, advice about the opportunities on the basis of the Investment Promotion Act and consult about national and EU funds, assist in achieving incentive measures and provide support after the investment). As a non-profit corporation exclusively owned by Međimurje County, REDEA is acceptable to the funds available through various EU funded programs. Therefore we have been successful in applying and implementing a number of projects to support entrepreneurship. For example, projects that have linked are cross-border entrepreneurs in various cross border areas, entrepreneurial training, marketing and business improvement, participating in trade fairs, study tours and other activities that entrepreneurs did not bear the additional costs. Metal core is one of the most important strategic projects REDEA. Preliminary analyses of engineering industry in Međimurje and the surrounding counties have identified the need for specific services to be developed and made available to SME’s through the launch of a new Development and Education Centre for the metal industry – METAL CORE, with the aim of strengthening their competitiveness. With the establishment of the Development and Education Centre for the metal industry we will contribute to the technological development of metal industry in Međimurje County based on the transfer of new knowledge and the application of innovation. Implementation of the project will develop a high-quality infrastructure and basic and advanced services intended for potential and existing entrepreneurs. In July 2015 REDEA has started implementation of the project "Development and Education Centre for the metal and engineering industry - Metal core" which is funded by the Ministry of Science, Education and Sports.